It’s been a relatively volatile time in the polls of late, and that continues this week. The Tories dropped 2 points in our average a fortnight ago, then gained 1 last week and now lose 1, putting them back down to 31%. Labour, who dropped 2 points last week, have not gained from the Tories’ fall and remain on 34%. Instead, the beneficiaries are UKIP (up 2 points to 17%) and the Liberal Democrats (up 1 to 9%). The Conservative-to-UKIP swing might well reflect the mood change following the Clacton and Heywood and Middleton by-elections last week. We’ll need to wait to see how long it lasts, though, especially given the recent volatility. The upshot in our forecast is a partial reversal of last week’s big shift towards the Conservatives. Labour are back in front again as the slight favourites to win the most seats, with a 53% chance to the Tories’ 47%. The Tories’ fall and Labour’s failure to recover in the polls leads to their lowest combined share yet: 65% in both the current average and our central forecast. With the two parties so close and their combined share so low, the chances of a Hung Parliament rise again, to 57%, surpassing the previous high of 54% last week. In our central forecast, the Tories get the most votes (with 34% to Labour’s 31.3%) but not the most seats (with 291 to Labour’s 298). That would leave Labour 28 seats short of a majority, while the Lib Dems would have 31 MPs in their best seats forecast since April. Very interesting. There’s been a lot of recent media speculation about the possibility of UKIP winning some seats and how many they might secure. 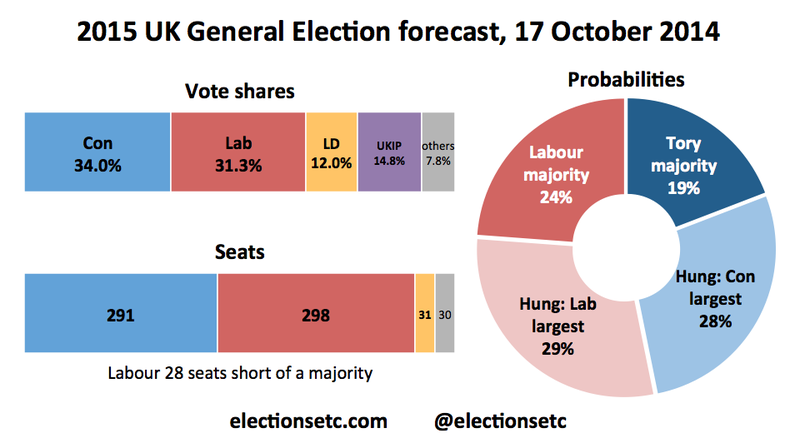 Is there a tipping point in your model when UKIP seats will begin to manifest? Or are they already included in “Others”? Although the polling samples are small for Scottish electors there does appear to be a prevailing swing against Labour in all polls since the Referendum. The extent of the current swing, if maintained, would put in question assumptions about the around 35 to 40 Scottish Labour MPs included in the total. Is there a point in time where the prediction formula may have to be reviewed?